The Antiphona by Johannes de Teschen. 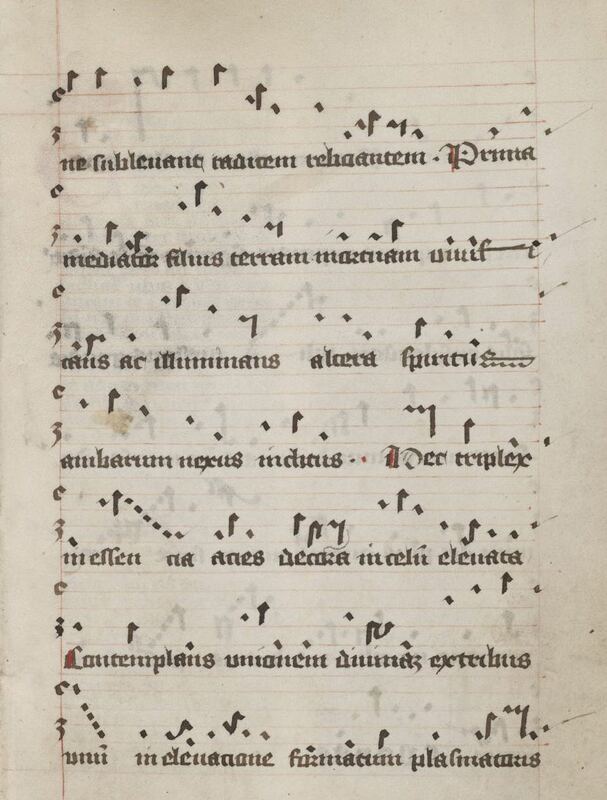 An early example of alchemical music in MS Mellon 5 created round about 1400, in four pages folio 2r - 3v. 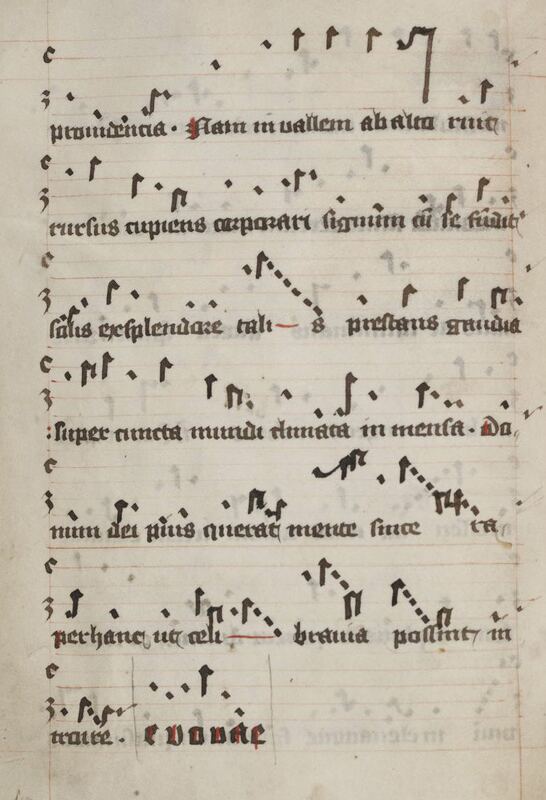 A through-composed, monodic song in the Phrygian mode without formal structure, written in Hufnagelschrift (horseshoe neumes) on red, five-line staves, F and C indicated on the second and fourth lines from the bottom of each staff, respectively, the text written in a single broad line below the staff. 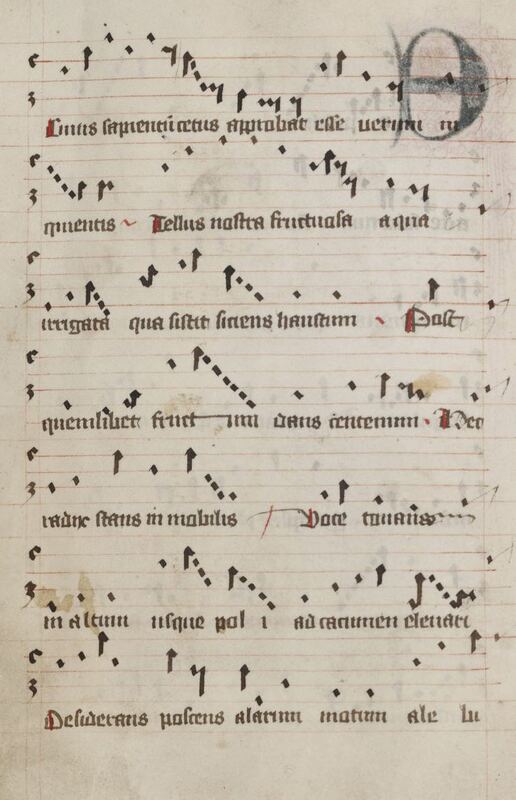 Seven staves and seven text lines to each page. 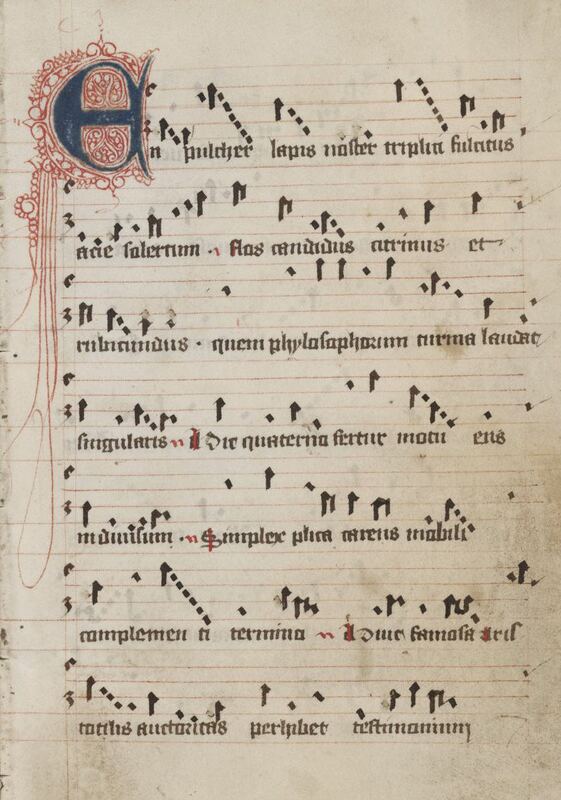 The music is independent of liturgical sources. troire. E.U.O.U.A.E. [i.e. seculorum Amen]. Behold our beautiful Stone, made strong by a threefold acuity, a most ingenious thing, a white, black and red flower, which the whole host of Philosophers praises for its uniqueness! Every fourth day the undivided entity* is made ready by motion. It consists of a single involution and lacks the motility to fully complete the process of perfecting**, a statement to which Aristotle lends his famous authority, while a multitude of other Sages also swear that this is the case. But our most fruitful Earth is irrigated by water, by which it comes into existence, and which enables it to slake its thirst and then produce any fruit you care to name one-hundredfold. By God's will the root stands firm amid the motility. With a voice of thunder it asks to be raised to the top of the Earth's pole, desiring - nay demanding - that form of motion that only wings can provide. And so the Wings of the Moon raise the clamouring root upwards. The first wing is the mediator, the Son, Who vitalises and illuminates the dead Earth, while the second wing is the Holy Spirit, the interposed connection of both. God then raises heavenwards the glorious acuity, which is threefold in essence and which contemplates the union and dwells lovingly upon the One created from the Three, formed on high by the providence of the Lord Creator. For the root falls from on high into the valley, once more desiring that the Sign be made corporeal, since such a thing pours itself forth from the splendour of the Sun and casts things of joy onto all worldly goods. The truly pious bring a sincere mind to their search for the gift of God, so that they can enjoy the fruits of the Kingdom of Heaven. For ever and ever, world without end, Amen. * ens indivisum: this is a Thomist term - see, for example, St. Thomas Aquinas, In Metaphysicorum, 4.2.6: Est enim unum ens indivisum, 'For what is one is an undivided entity'. ** terminus complementi: another Scholastic term, see Henry of Ghent, Summa quaestionum ordinarium 44.1, II. 12VF.